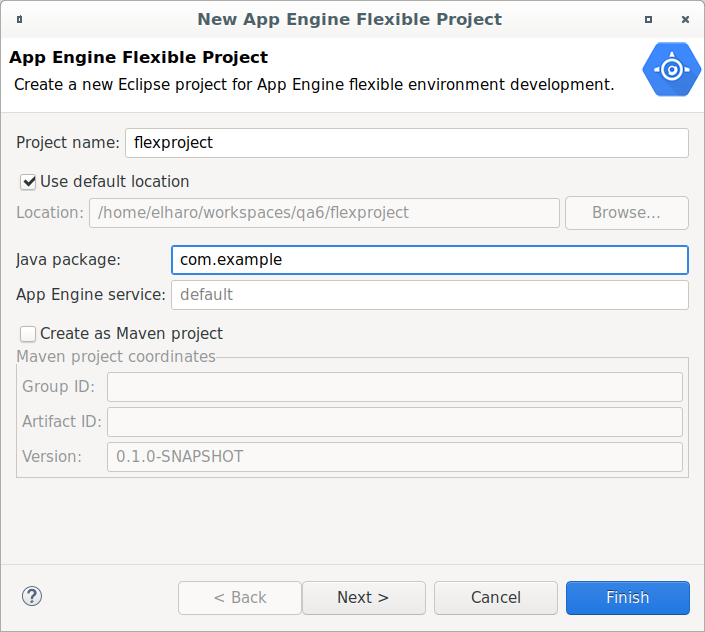 Cloud Tools for Eclipse provides a wizard inside Eclipse to create new applications for the App Engine flexible environment. Ensure you have the latest version of Cloud Tools for Eclipse. The New App Engine Flexible Project wizard displays. Enter a Project name for your application. Enter a Java package name. Select the Create as Maven project checkbox to generate a pom.xml and configure the Eclipse project to use the Maven builder. Enter the Group ID and Artifact ID for your Maven project. The new application appears in the Eclipse Project Explorer. Once you've created an application, you can run and debug it on your local workstation.